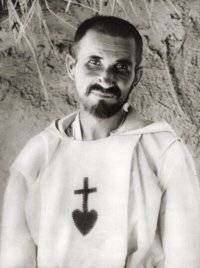 Charles de Foucauld was born into an upper class Strasbourg family in 1858. His parents died when he was quite young leaving him a large fortune, which like the parable of the prodigal son, he spent on rowdy parties, froie gras and champagne. He served for a time in the French Foreign Legion in Afghanistan. Whilst there, he found a growing fascination with Islam but he remained firmly an agnostic, but something was happening. Returning to France he embarked on a spiritual quest that led to him to stop frequently in Catholic churches to make a simple prayer - God if you exist, let me know it. Finally in 1886, in St Augustine’s church in Paris, he experienced a profound answer to his prayer and was converted. He began to discern a vocation centred on the ordinary life of Mary, Joseph and Jesus. He entered a Trappist monastery and was eventually assigned to Syria where his work was to supervise Muslim manual labourers who worked there. It was here that he discerned a call to serve not lead; he left the monastery and became a gardener for the Poor Clares in Nazareth. He was ordained in 1901 and returned to Afghanistan to live as a hermit - during the day labouring alongside the locals and translating the Gospels into the native dialects and at night lost in adoration before the Blessed Sacrament. He was murdered by a band of anti-French tribesmen on December 1st in 1916. His life of self-denial remains inspirational to this day. Self denial like that of Charles de Foucald is as counter-cultural now as it was then - a car overtook me yesterday having driven hard behind me in a queue of traffic for a few miles, just to get one car in front. Or the lady in Wallmart in the USA who pulled a gun in a fight over the last notebook in the school supplies section. Or commuters on a train whose bags need seats but haven’t paid for a ticket for them. Or the able bodied person who parks in a disabled space because they’ll only be a minute… and I’m sure you can think of many other examples too. Assuming that this passage follows on chronologically from last week’s, Jesus and the disciples around Caesarea Philippi and Jesus is curious as to whether people understand who he is. Amid a variety of responses, Simon Peter proclaims Jesus as Messiah and Jesus affirms Simon as trustworthy friend and on this proclamation of faith the church will be built. From here though, Jesus’ eyes and focus turn to Jerusalem, the place of his trial and passion and so He begins to teach his disciples that this is where all this is heading. Jesus said: If any want to become my followers, let them deny themselves and take up their cross and follow me. 25For those who want to save their life will lose it, and those who lose their life for my sake will find it. Hurricane Harvey has just devastated parts of Texas leaving 42 people dead and some 43,000 people out of their homes. In the midst of the criticisms of how fast the president and emergency services responded come stories of people opening up their homes to support the needy as some 20% of the homes in Houston do not have flood insurance - a clear indicator that this happens with some regularity - but also a clear indicator that the poorest and most vulnerable have been left poorest and most vulnerable because those who need that insurance couldn't afford it. But this story made the news above the devastating floods in Mumbai that have killed 1200 people and shut a million children out of school. Many here have lost lives and livelihoods. Many are grateful they have been saved. What is Jesus talking about in terms of losing and saving life? The word translated for life is the word from which we get our word psyche - our individual conscious selves, that which makes us us. The issue is that there are 3 words for life in Greek - Bios (alive as in biologically alive), Psyche, and Zoe (literally ‘with-God-life’ or eternal life.) Jesus is encouraging his hearers to put to one side our priorities in life - manifesting itself as an innate quest to survive at all costs at best, or as selfishness at worst, and instead to seek the life of the kingdom where our own selfishness self-preservation is secondary and God’s ways and purposes have first place in us for the good of all. All of this happens though in the shadow of the cross, which all too often reveals us as we really are. The cross showed Peter to be the one on whose rock like faith the church will be built but also to be a stumbling block. The cross showed Jesus to be a political revolutionary but also a spiritual messiah. The cross isn't just empty - a symbol of hope, that all will be well and that Jesus is alive, but it also continues to be a place that judges our motives and drives. You may wear a cross on a chain round your neck, but we all wear one by virtue of our baptism, is not just to show the world who you are, but to remind you of who the world needs you to be. Before the cross signified salvation, it was the instrument of condemnation. It was a sign for what happens when power is crossed, when we lose our life, and when you instead choose the life of the kingdom living out forgiveness, love and peace, which means the willingness to stand against power that silences and oppresses: the insistence on speaking up for those the world would crucify; the courage to call a thing what it is. It means the resolution to renounce those systems and institutions and leaders and yes all too often ourselves - who choose themselves over others, and all those who choose their own needs over the good of all.